Barbuda is just a little island of approximately 1,600 villagers in the Caribbean. Hurricane Irma touched down in Barbuda on Sept. 5, ravaging the area with winds of 185 miles per hour. Barbuda is just a little island of approximately 1,600 villagers in the Caribbean. Hurricane Irma touched down in Barbuda on Sept. 5, ravaging the area with winds of 185 miles per hour. One teacher at Curtis Elementary School calls Barbuda home. Deborah Parker, early-learning specialist, started updating all her fellow teachers about the destruction in her home just around the time the storm came into the area. “Please pray for my island,” Parker shared with her coworkers by e-mail. “My family owned a bakery there, and my sister, nephew, and others were living there; the bakery is gone and all the homes,” she said. The entire population had to be evacuated to the mainland of Antigua, where they are housed in shelters, having no homes to return to on Barbuda.The teachers at Curtis wanted to know what they could do to help Parker. A fifth-grade teacher, Sarah Miller wanted to do a service project to help Barbuda. So, she reached out to Parker and asked what they could do. “We have dedicated this year to being a service classroom, so now their [the student’s] actions can help others,” Miller said.Parker wanted to do something to help the elementary school on Barbuda, Holy Trinity Primary School. 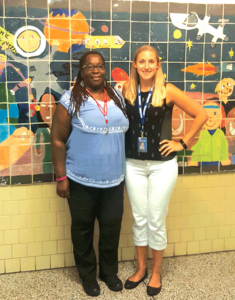 She began her teaching career there years before and served as the principal. “That school is devastated, it will need to be completely rebuilt,” Parker explained. “The children will need books and supplies to even begin to get their education again and it will possibly be two to three months before they can start their lessons again.”Parker finds that her efforts can help the students where she used to teach. “I wanted to initiate a book and supply drive for the school and library,” Parker shared. “Having school resume will bring some normalcy to the people on the island,” she explained.Parker and Miller teamed up. Miller’s class would become the spokespersons, and they would collect the supplies. They created posters and led the effort to collect supplies from the students and community. School counselor Marjorie Boehlert has helped in their efforts as well.Miller’s classroom is leading the effort, and she couldn’t be more eager. “During this year of service learning at Curtis, the children are so enthusiastic,” Miller shared. “They are excited to lead the effort and make a connection and help others.” “The Curtis community is my family,” Parker explained. “We as a school are all excited to be able to help the children and teachers of the Holy Trinity School in Barbuda.” A few members of Parker’s island community from Atlanta, Washington D.C., and Virginia have worked out the logistics and means for the donations to be delivered to the Antigua and Barbuda Embassy. The precious books and supplies will then be transported to the island to assist in the recovery and rebuilding efforts. Parker is hoping to fill a pod to the brim. She knows this means a lot of donations in a hurry. She wants to get as many new or mildly used books and school supplies as possible by Friday, Oct. 13. Donations can come from the community. Just drop those books sitting on bookshelves, or new books and school supplies, off at the front reception area of Curtis Elementary School to participate. Parker said she had just been so impressed by the community. Two other schools have reached out and wanting to help with the book and supply drive. “We get people saying ‘Can we help? What can we do?’” said Parker. “This is an amazing community, their giving spirit and making a connection, because one story, one book, can make a difference.”Deliveries can be made to the Curtis Elementary reception area until Oct. 13. The next day, they will be delivered to D.C. and on their way to the children and teachers of Barbuda.